The Item Shop allows players to purchase a variety of items through gold, mileage points or CERA. The Point Shop tab is where players can buy items with mileage points. 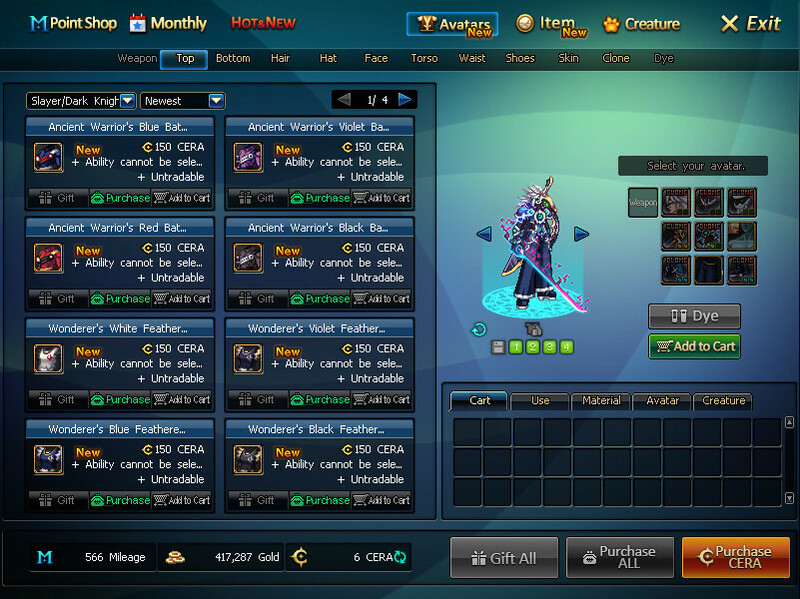 The Monthly tab is where players can view and buy the current month's avatar set. Mileage can be gained starting at Lv. 20 when you complete dungeons within your level range. When spending CERA, you will gain 20% of the purchase as Mileage (i.e: 1,000 CERA purchase nets you 200 Mileage). Click "Item Shop" in the Service Menu at the bottom of the screen. Click your hotkey for the Item Shop (Default: F5). Generates 1-100 Powerful Energies, Interdimensional Fragments, Meteors (4 kinds), or Chaos Stones. Generates 1-100 Clear, Gold, or other colored Cube Fragments. Increases your Exorcism Parameter by +10 for 30 minutes. Increases your Exorcism Parameter by +12 for 30 minutes. Extends the duration of an avatar by one day. Extends the duration of an avatar by seven days. Extends the duration of an avatar to unlimited. A different number of tickets is consumed depending on the levels of entering dungeons. Right-click the item to check the number of Demon Invitations required for each dungeon. Increases the gold obtained in by 50% for 20 minutes. Increases the chance of looting unique items in dungeons for 20 minutes. Can be used in any dungeon to resurrect your character. To use a Token, press the attack key when you are dead (Default: X). Resets your entry count back to 2 for Goblin Kingdom, Castle Nebulous, and Rangelus's Guerrillas. Automatically consumed if you try to enter. Restricted to 1 usage per day. Resets your entry count back to 2 for Void Rift, Dark Side, Castle of Bakal. Automatically consumed if you try to enter. Restricted to 1 usage per day. Use this item after clearing one floor in Tower of Despair to be able to challenge the next floor in the same day. Restricted to 1 usage per day. Cures all harmful status effects for all levels. For 10 seconds, you are immune to abnormal status effects. Immediately restores 30% of your Max HP and MP. "My touch shall set you free from pain. -Remy Dios"
Immediately restores 30% of your max MP. There is no cooldown. Place any weapon or armor item into the Kaleido Box and its base stats will change randomly. Once a Kaleido Box is used it cannot be used again. The Echo Megaphone allows you to send a message out to everyone in your entire server. Let your voice be heard loudly. Use Skeleton Keys to unseal Lost Treasures. You need three Skeleton Keys to unseal one Lost Treasure. Golden Candles are used to reseal unsealed items. The number of Golden Candles required to reseal an item depends on the level requirement, rarity, and number of times the item has been resealed. Only items that have been unsealed before can be resealed Items cannot be resealed more than 7 times. For everytime an item has been resealed, it will cost 1 additional candle. Enables you to combine Avatars of the same slot type to create a Rare Avatar. The chance to create Rare Avatars increases when using Clone Avatars for the materials. Can only be synthesized with Avatars identical to the job skills that uses the Bind Cube. Note: All contracts are applied immediately upon purchase and effect all characters on the server. A different buff will be granted to you for 30 seconds when entering a dungeon depending on the cube you pick. The selected cube fragment will be consumed every 30 seconds. Colored cube fragments: Enchants your weapon with an elemental attribute. Clear cube fragments: Increases your physical and magical attack strength by +40. Gold cube fragments: Critical hit rate +5% and Exorcism +7. Increases Quest Item drop rate, Quest EXP, Hunting EXP and Dungeon clear EXP by 20%. Boss unique equipment drop rate will be increased with more party members. Also gives you a 4% chance to inflict an additional 500 damage when attacking. Allows you to wear equipment up to 10 levels above your current level. When the contract expires, all gear above your level will be moved back into your inventory. Any equipment items that you unseal will remain unsealed. Does not apply in the Arena. Allows you to learn and use skills up to 5 levels above your current level. When the contract expires, any SP spent on these skills will be refunded. Does not apply in the Arena. Increases the size of your safe in Seria's chamber. Note that you must purchase one safe upgrade at a time. Only the next upgrade will appear in your Item Shop screen as a purchase option. All safe upgrades have no weight limit and are permanent. Increases the size of your account safe in Seria's chamber. Note that you must purchase one safe upgrade at a time. Only the next upgrade will appear in your Item Shop screen as a purchase option. All safe upgrades have no weight limit and are permanent. Note: Level 60 minimum is required for Account Safe. These options will not appear until a Character on the account reaches Level 60. Alternatively, you can trade Nihilistic Demon Stones to upgrade your Account Safe up to Level 7, in which CERA is required to upgrade the safe past level 7. For 30 days, this license allows you to place CERA items as well as up to 30 items on the Auction House. This item is applied immediately upon purchase. Using this item will expand all tabs in the inventory by 1 row and 10 Kg. Only applies to this character (Applied immediately after purchasing. Avatar and Creature tabs are not affected. Enables you to rename you character. Names that already exist in the server cannot be used. Can only be used in town and cannot be used if character is dispatched as a Mercenary. The ticket will automatically redirect you to the Character Selection Screen upon use. Adds 1 character slot. Up to 5 Extension Kits can be used. Use this item to have the Owl bring your safe to your current location. Can be used in town, Tower of the Dead/Illusion and dungeons. Can be used indefinitely with a 3s cooldown. Allows for a character to have an additional Skill Build, allowing for 2 different Skill Builds. This item is permanent on a character once bought. It only applies to the character you bought the license with. The additional Skill Build will have the total SP your main build has. Skill Builds can only be switched outside of dungeons. Allows you to change the name for your creature. Entering "No Name" resets the creature's name to its default. The card is consumed upon use. Feeding your Creature increases the speed of Charging Time for your Creature's skill by 30%. Creatures will automatically consume 1 food every 60 seconds while in a dungeon or when loyalty drops to 10 or below. The Selectable Avatar System allows you to preview and purchase avatars. You can buy avatars for classes that are not yours by using the drop down box close to the top left. Avatar price varies on the type it is. This page was last edited on 18 April 2019, at 15:43.